Four leading women professionals in the Jewish communal field describe moments that inspired their careers and choices that helped them flourish. BoardWalk Consulting has prepared a template to guide you through the 12 Steps to a Successful Search. Article: Unprepared for CEO Transitions: Where Will We Find the Next Generation of Nonprofit Executives? A study that shows how boards and CEOs need to begin addressing leadership transition right away, or they will find themselves scrambling and competing to recruit talented senior executives and to deal with the disruptions that these transitions can cause. Catalyst's longitudinal project follows the careers of graduates of leading business schools and has discredited a number of prevalent myths that suggest the gender gap in corporate leadership exists because of women’s choices and actions. A study by Catalyst asks, how do you make a seriously male-oriented organization more inclusive, so both women and minorities can advance? The study is the fourth in Catalyst’s Engaging Men research series. Through in-depth focus groups, it identifies the critical factors necessary for creating inclusive organizations. What will it take to shatter the glass ceiling? According to Debra Meyerson and Joyce Fletcher, it's not a revolution but a strategy of small wins - a series of incremental changes aimed at the subtle discriminatory forces that still reside in organizations. Article: Liberals Are That Way Too? An editorial by Rabbi Debbie Bravo calling out the Union of Reform Judaism on it's predominantly male leadership team and calling on the leadership to be true to it's values and promote gender equity. Program and agenda, along with participant bios, for 2007's Conference for Change. Men are five times more likely to submit Op-Ed articles to outlets than women. Katie Orenstein, founder of The Op-Ed Project and a partner of AWP's sought to change it by training women to get their voices into the public sphere. An article in The Atlantic urging men in technology to take a pledge not to participate on all-male panels; inspired by AWP's Men as Allies initiative. Learn how equity connects to effectiveness and diagnose your own organization, using scholarship and worksheets by Lotte Bailyn and Joyce Fletcher. Suggestions for aligning your heart and your head so that you can achieve “hustle” - those times in which you are driven by your personal purpose. Created by Echoing Green. Learn how equity connects to effectiveness and diagnose your own organization, using scholarship and worksheets pioneered by Lotte Bailyn and Joyce Fletcher. This helpful worksheet is adapted from the work of Linda Babcock and Sara Laschever, in their book, Women Don't Ask. A brief and instructive article for managers on negotiating with women employees. Business and professional organizations often operate in ways that can place women at a disadvantage. This article offers instructive insight on how negotiating is different for women. An article demonstrating the lack of gender equity in the Jewish communal world, pointing to a national conference sponsored by the Jewish People Policy Planning Institute as an example of gender bias to be addressed. Written by Steven Cohen and Shaul Kelner it references their eight studies of gender equity in the Jewish communal world. 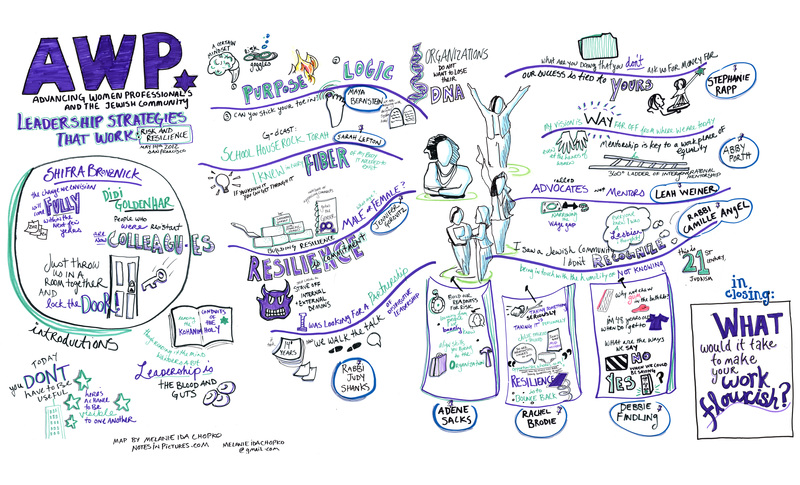 This graphic recording offers ideas on leadership strategies that will make your work flourish. It was created at an AWP convening of women leaders of Jewish organizations in Northern California. Questionnaire adapted from the surveys developed by the Johns Hopkins University Committee on the Status of Women and from the evaluation tool used by Working Mother magazine to select their annual “100 Best Companies for Working Mothers. Findings from AWP and the UJC's (now JFNA - Jewish Federations of North America) research on women's leadership in federations, and how that research lead to intervention and catalytic change. This report, based on nearly a hundred interviews with federation lay and professional leaders, explores the causes and implications of the gender imbalance, and then recommends strategies for change. Leading a change experiment: You can lead a change experiment in your organization. Start with research to assess current conditions and decide where to target your efforts.